Little Wombat®Baby Wrap is more than just a baby wrap. It gives your baby the feeling of security and love. At the same time it does not limit you as a mother or father in your everyday life. Thanks to the soft material, you can wrap the sling as often as you like around your hip. Our baby wrap is handy and you can stow it easily in its integrated bag on the end of the sling.That´s why it fits in every diaper bag. The combination of special high quality fibers connects comfortable baby-carrying with reliable stability. Moreover our material is also skin-friendly and breathable. A conscious material-production and a high quality manufacture are ensured by our partners in the south of Germany. All components are vegan, resource-friendly and hand-made. ... you strengthen the bond with your baby and at the same time enjoy the benefits of a safe and comfortable baby wearing from birth. 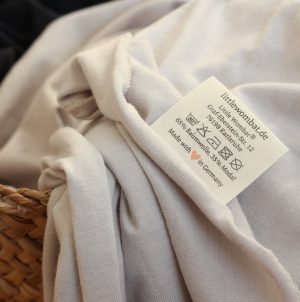 Our slings are produced sustainably from organic cotton and beech fibers in Germany. All ingredients are vegan, resource-saving and still made by hand. Thanks to the lightweight fabric, our elastic sling can be pre-tied easily. It has a length that suits everyone and can also be easily stowed in almost every diaper bag thanks to the integrated bag.